While Korean investors are looking to expand in Myanmar’s manufacturing and infrastructure sectors, the economy can only grow if the government puts an end to discrimination against foreign investments, a Korean business leader said. Two more fish processing plants in Myanmar have been permitted to export their products to the European Union (EU), bringing the total number of such plants allowed for export to EU to 23, the official Global New Light of Myanmar reported Monday. Peanut and sesame oil manufacturers are facing the “palm oil and mixed oil brick wall challenge”, as palm oil is the dominant player in the edible- oil market, a regional industry leader said. 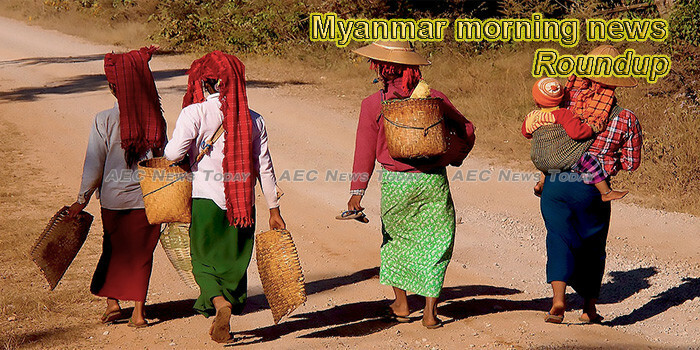 Myanmar’s total population peaked over 54 million in 2019, an increase in the country’s population by more than three million according to the 2014 nationwide census, as per data from the official website of the Ministry of Labour, Immigration and Population on January 6. The Myanmar Gems and Jewelry Entrepreneurs Association has formed a gold and gems central market implementation committee with the aim of working with and lending support to the state-led Gems and Gold Market Implementation Committee, said U Kyaw Win, the chairman of the association. Survey work for the Sino-Myanmar railway and soil testing is now being conducted by China Railway Eryuan Engineering Group Co. Ltd. The new railway track will connect Mandalay with Kunming. Myanmar’s southern Tanintharyi region authorities have reopened border gates and island resorts after the weather bureau lifted its warning on tropical storm Pabuk Sunday, the official Global New Light of Myanmar reported Monday. Property prices in Dala Township are rising after construction of a bridge linking Dala to downtown Yangon was finally given the green light on December 24, 2018 after six years of deliberation. Kyauktada, a township located in the heart of Yangon Region, launched a smoke-free awareness campaign at the Maha Bandoola Park in the commercial city yesterday afternoon. In 2015, Worldview International Foundation began a mangrove restoration project, planting saplings of the trees on about 121 hectares of land in Myanmar’s Ayyerwady region. Japan and the United Nations (UN) World Food Programme (WFP) have agreed to support Bangladeshi farmers and the people displaced from Myanmar. Telenor Myanmar said its SMS traffic rose 440 percent over New Year’s Eve to 1.85 million messages, setting a new record for the year. The company also reported higher data traffic on Facebook and Viber compared to a year ago on the holiday. Myanmar is planning more promotional activities to attract visitors from Macau and Hong Kong, while implementing digital marketing to develop the country’s hotels and tourism sector, reported the Myanmar News Agency. Karen people across Myanmar celebrated Kayin New Year’s Day yesterday after a year marked by violence, displacement and dwindling aid. The first nursing care workers from Myanmar to participate in Japan’s foreign trainee program arrived at a Hokkaido airport on Monday amid expectations that the Southeast Asian country will provide much-needed workers. The people of Yangon and visitors were treated to three days of fun and good buys at the Made In Myanmar Fair at the Myaw Zin Kyun area on Kandawgyi Lake as the country celebrated its 71st Independence Day, last week.